Very nice two bed - two full bath Condo, remodeled and decorated in bright colors. Located on West Beach only 0.75 miles from downtown Gulf Shores and a few steps across the street to the Gulf of Mexico with private beach access. There are two large pools, one for both kids and adults and one for adults only, both with large well equipped decks. Fully equipped kitchen with newer appliances, queen sized sleeper sofa, full wireless Internet, cable TV 32' LCD screen and DVD player in living room. Both bedrooms have queen beds with 32'' LCD TVs. Overhead fans in living room and both bedrooms. Quiet location at the back of the complex, first floor unit #125, only one set of stairs, with parking under the condo. Note 1) This is a non-smoking, no pet unit. Note 2) Short notice rentals possible. My mother and dad bought the place while it was being built in 1983. Been in family ever since. I grew up going down their and now my kids and grand kids and doing the same. For our first time to the gulf this was a great place for us! We had everything we needed! This was a great place to stay! Just what we wanted close to the beach and eating places and a pool! Nice and clean with all the amenities! Loved it!!!! The room was GREAT. Plenty of room. 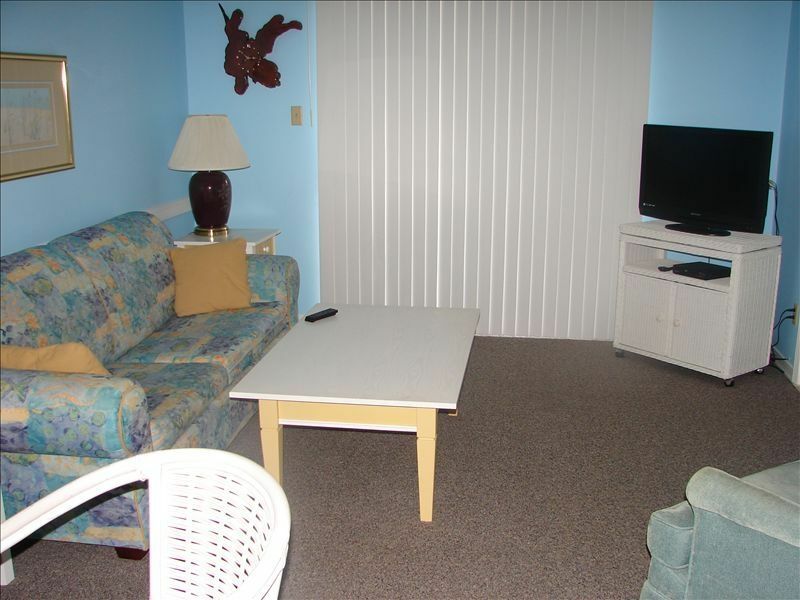 Walking distance to restaurants, shopping and the beach right across the street. Will definitely be back. Thanks for an AWESOME stay. We loved the close proximity to everything. There is a public beach access almost directly across the beach which was perfect for us since we had 3 little kids in tow. We were able to load all beach stuff up and pile in the car and drive the few feet to the beach access and park so we didn't have to worry about going across the road with little kids and tons of stuff. There is also public restrooms off the boardwalk which was great and a lifeguard on duty! It wasn't crowded even though we went down in July. We spent our mornings at the beach and afternoons at the pool. The condo itself was clean, well maintained, and comfortably fit my family of 5. (One on the pullout couch and 2 per room). There's even a little mini mart grocery store almost directly beside the condo so if you need drinks or snacks you can walk there. We enjoyed our stay and can't wait to be back again. This property was perfect! Great location right across the street from the beach with a nice view of the water! We loved having two bedrooms and bathrooms, laundry on site, and beach supplies including chairs, toys and a cart (all courtesy of the owner)! The pool was also very nice to have!! Larry was very accommodating during our stay and we would highly recommend this property! Perfect location! Clean and comfortable! This was one of my favorite rentals ever! Very clean. Perfect location to beach and restaraunts. Enough room for my family of 5. Lots of great amenities. Would stay here again for sure! !